Herb & Soul has been open for nearly four years! We are so grateful for the opportunity to share our gift and our love with you all throughout those years. From humble beginnings to popular acclaim, you've been there to support us. And while this isn't easy, our decision to close the doors on the restaurant and focus on our corporate catering and event planning side of our business, is necessary. We have sooooooooo enjoyed being a part of the greater Parkville/Towson community. We love the opportunity we were able to give to so many aspiring artist and musicians and being a great place to come for a meal with family and friends. Collectively as a unit, and individually as owners, we are taking a hiatus to focus on other ventures. 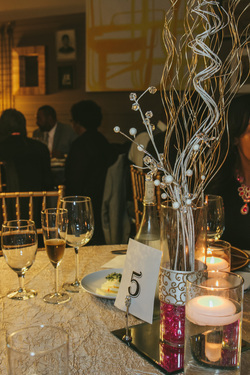 To inquire about our H&S catering services for events , please email us: @ herbandsoul@gmail.com. At Herb and Soul, our food philosophy is quite simple. We are a natural, local and sustainable southern fusion restaurant. Although terms like "farm-to-table" are sometimes overused in the culinary community, in our kitchen you join us in supporting sustainable agriculture that respects the abundance and traditions of our region, while helping to ensure its future. Herb & Soul is a labor of love. We pride ourselves on being a family of people who love good food and great company. While we are extremely grateful to have won a few awesome awards and to have garnered some amazing reviews and ratings from our customers, it is not our aim to brand ourselves as a lofty fine-dining establishment or a trendy eatery. On Fridays and Saturdays when we open the doors of our Gastro Cafe in Parkville for dine-in dinner service, it is our goal to make you feel as if you are dining with your closest friends and family... because to us, that's who you are. When you zip into our Express location on Harford Road for a quick lunch order or carry-out/delivery, we want you to have that same feeling. At Herb & Soul, we cherish and hope to revive the days when mealtime involved not only good food that nourished the body, but also fellowship and warmth that nourished the soul. Know that we strive to make decisions about the food we serve the same way you make decisions about the food you consume. We care about the sources of the food we prepare, and while sometimes — due to price, availability, or quality — we can’t perfectly source every item, rest assured that we share the same values as you do, with regard to quality. Herb & Soul is a "slow food" operation. We don't take shortcuts in our kitchens. We cook all of our food fresh and to order. Our menu changes on a weekly and seasonal basis, which affords our chefs the freedom and creativity to prepare some of the freshest, most thought provoking and delicious dishes around town. However, we will always have a few permanent items on our menus, such as our much beloved Old Bay Fried Chicken, the Local Blue Catfish, or The Herb & Soul Philly at our Express location. And don't worry! We always have our vegan, vegetarian and gluten-free friends in mind too! We are a small operation but we are growing! So, we ask that you be patient with us while we grow. We strive to deliver excellent customer service and your comments and suggestions are always appreciated. If you'd like to know what's on the upcoming menu, you can always visit our website, our Facebook page, or simply give us a ring! Come and experience true natural southern fusion cuisine at Herb & Soul!